The Women’s March banned Students for Life from its event this past weekend. But the young, innovative group of activists got revenge by planting themselves — and their oversized banners — at the front of the march. The move got the attention of thousands on social media, who shared the image on Facebook and Twitter. It got my attention too. So I contacted Kristan Hawkins, president of Students for Life, and was able to interview her today. 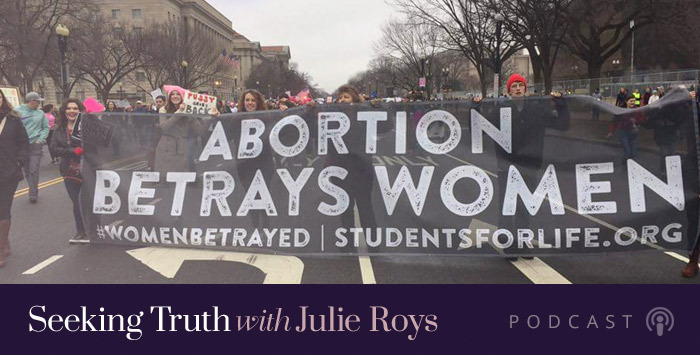 Hear about her fascinating — and at times, terrifying — experience at the Women’s March. Plus, Kristan discusses some of the ingenious ways her group is successfully engaging the Millennial generation with the prolife message – and why it’s critical that as many prolife supporters as possible attend this Friday’s March for Life! God bless you for your courage in standing up for those precious, innocent babies who have no voice of their own! Nobody was banned from marching. That is a huge lie. One group that wanted to be part of the organizers was turned down, but banned from marching? Not. The organizers told them they weren’t welcome. And then, when they marched anyway, they were jeered, spat on, and had their signs ripped from their hands and destroyed. Ya, it’s a huge lie that they were banned.